In order to improve care providers patients relationship management Philips is expanding its HealthSuite platform in partnership with Amazon Web Services (AWS). 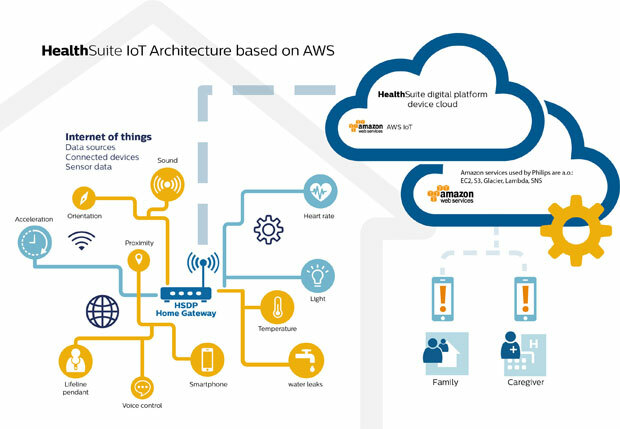 The new AWS IoT platform will make it easy for devices to connect to AWS services, which will expand the connectivity, capabilities and services of Philips' HealthSuite digital platform. Philips said they are collaborating with companies such as AWS to achieve global scale and accelerate the realization of connected care across the health continuum from healthy living and prevention, to diagnosis, treatment and home care. HealthSuite securely collects, aggregates and analyzes data from a variety of apps and medical devices and systems such as EMRs (Electronic Medical Record). Philips HealthSuite digital platform (Comprises of eCareCompanion and eCareCoordinator) is already running on AWS and managing more than seven million connected devices, sensors and mobile apps. With AWS IoT, Philips said they will enhance its platform with a future proof, secure and scalable IoT environment. "By unleashing data from connected devices and health records, combined with analytics, valuable insights into how we can live and age well can be uncovered," said Jeroen Tas, CEO of Philips Healthcare Informatics, Solutions and Services. At Philips, we seek to empower consumers to be active participants in their own health. For example, by giving them access to and control over their own health information, making that data more actionable, and by facilitating better collaboration between patients, clinicians and caregivers." With AWS IoT, Philips said they will create added value for customers in terms of smarter and more personalized solutions for healthier living and care coordination, and allow products – like medical alert systems and baby monitors – to grow smarter over time. One example of how AWS IoT in the future could support new solutions enabled by the HealthSuite digital platform is the support of the growing population of seniors. Seniors often manage one of more chronic conditions. Philips aims to enable seniors to continue living independently and more safely in the comfort of their own homes for as long as possible. With the extra capabilities of AWS IoT added to the HealthSuite device cloud, it will be easier to acquire, process, and act upon data from heterogeneous devices in real or near-real time. Propositions to support independent living, for example Philips’ HomeSafe Medical Alert system, could potentially easily be expanded with other and new-to-market devices. With advanced analytics, the combined data from these devices will give greater insights. It could, for instance, help to respond at an earlier stage to deteriorating health conditions by picking up subtle changes in one’s lifestyle over time, both inside and outside the home.